This website and the work we do could not have been possible without our sponsors. Here, we take some time to recognise them and thank them for their support. The City of Canning’s Parks and Conservation team supports us on a day-to-day basis with help on the ground. The City provides practical support in so many ways that it is impossible to list them all. From providing bags for us to fill with rubbish and weeds which they then collect for disposal, to lending tools, sharing expertise and arranging contractors, the City works with us to protect our natural environment. In 2017 we received a Small Community Grant from the City to add three new designs to our suite of greeting cards. 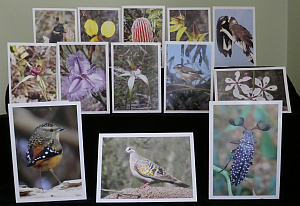 The generous support from the City of Canning has ensured that all proceeds from the sale of these cards goes directly towards nature conservation. Cards are available for purchase from the Canning River Eco Education Centre at the corner of Kent St & Queens Park Rd, Wilson. Quattro: The New Queens Park is proud to support the Friends of Queens Park Bushland. Quattro has fast become a sought-after choice for families looking to build a new home close to the city. It’s an award winning community recognised for excellence in planning, design and sustainability -and a terrific sense of community. Beautiful native landscaping is a key feature and each of the 260 homesites has great access to local parks, bushland, shopping and transport. Just 11 kilometres from the Perth CBD, this innovative urban renewal project is a partnership between Peet Limited and the Department of Housing. The Friends of Queens Park Bushland (FQPB) wish to thank the Department of Parks and Wildlife (DPaW) for its generous support in assisting our efforts to restore and rehabilitate the natural vegetation of the Queens Park Regional Open Space. A grant from DPaW of $10,979.10 in 2014 will pay for plants, summer watering and signage in the Queens Park Regional Open Space. The plants will help to revegetate a degraded patch between two areas of good bushland. This will help create a corridor along which native fauna can move. The signage will indicate areas of Phytophthera dieback in the bushland. This will show the public where the pathogen is present and, with their help, slow its spread. The Friends of Queens Park Bushland (FQPB) wish to thank the Western Australian Government’s State NRM Program (State NRM) for its generous support in assisting our efforts to protect, restore and rehabilitate the natural vegetation of the Queens Park Regional Open Space. A grant of $40,000 in 2015 will be used to continue protection of the bushland from Phytophthera dieback disease and control weedy grasses. Phytophthera dieback disease is a pathogen in the soil that infects susceptible plants and stops them being able to access water and food. Treatment of vegetation in infected areas helps to boost their natural defences against the disease and limit its spread. Weedy grasses compete with the natural vegetation for water, food and light – the three things essential for a healthy plant. They also increase the fire fuel load in summer when they die off. Keeping the weedy grasses under control allows the natives to grow better and reduces the risk of a severe fire. A grant from State NRM of $30,400 in 2013 will pay for a joint project between the City of Canning and FQPB for hand weeding and mapping environmental weeds in the Queens Park Regional Open Space. The project will be supervised and administered by the City of Canning. FQPB and the City of Canning have been working to remove targeted environmental weeds which outcompete and degrade local area vegetation. These weeds also contribute to the summer fire fuel load. The grant will greatly assist us to achieve our goals. We are excited to be the developers of this dynamic website. As a local business, and also living locally, we wanted to support initiatives in the area. Our team spent many hours designing and building this customised website under instruction of the committed FQPB team. We think the collaborative effort has resulted in a website that highlights the beauty and biodiversity of the Queens Park Bushland area. Web Wizards is a top Perth Web Design company. Our aim when creating a website for our clients is to combine great Web Page Design and Website Development with Web Traffic Strategies to deliver best results for their business or organisation. Many thanks go to the Queens Park Pharmacy for the donation of a first aid kit. Their support helps to make our activities safer for everyone. The Friends of Queens Park Bushland (FQPB) wish to thank Bankwest and their Happy Communities initiative for their generous support in assisting our efforts to build a stronger community through nurturing the natural environment in the Queens Park Regional Open Space. A grant from Bankwest in 2012 enabled us to purchase plants that were planted by the children of the East Cannington YMCA Early Learning Centre. The children now take great pride in nurturing and protecting their plants. A further grant in 2014 allowed us to purchase equipment that helps us look after the bushland. The following links will take you to websites that we find useful in our quest to obtain knowledge about the world around us. http://lepidoptera.butterflyhouse.com.au/ has a huge number of moths, butterflies and their caterpillars photographed and described. David R has helped identify some of our invertebrates and for that we thank him. You can follow David’s nature observations in a rainforest in Kuranda, Queensland, at http://www.bunyipco.blogspot.com/. David Knowles from Spineless Wonders has also been invaluable when it comes to identifying our invertebrates. Find out more about David at http://spinelesswonders.com.au/ .